This sauce is perfect for those tomatoes that are a bit too ripe and soft for salads. Chop them up and let them reduce to create this light, fresh marinara. In a large sauce pan saute your garlic and onion with a small amount of olive oil, about 1 tablespoon. Season with salt and pepper. Once the onion has softened add in your tomatoes, season with salt and pepper. Allow to simmer and break down for 10 - 15 minutes. You also want some of the liquid from the tomatoes to reduce a bit. Begin boiling water for your pasta making sure to season the water well with salt. 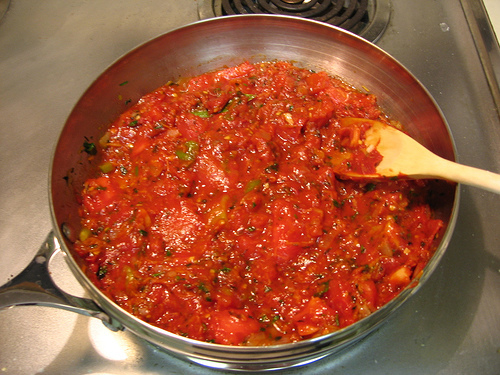 Add in the splash of wine to your tomatoes and allow to cook down for an additional 5 - 10 minutes. Boil your pasta according to package instructions for al dente. Once pasta has cooked, add in 1/4 cup of the pasta water to the sauce along with the pasta and basil. Allow to simmer for another 5 -10 minutes for sauce to slightly thicken and for the noodles to soak up the sauce. Serve with fresh parmesan cheese.